The Battle of Lone Pine was one of a series of actions fought by the Australian and New Zealand forces during the Gallipoli campaign. The fighting there lasted four days and resulted in over 2,000 Australian casualties, and an estimated 7,000 Turkish casualties. 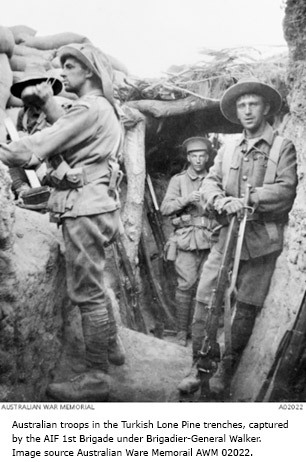 Of the nine Victoria Crosses awarded to Australian troops during the Gallipoli campaign, seven were for actions during the August Offensive, which included the Battle of Lone Pine. 6 August 2015 marks 100 years since the August Offensive, which began with the historic Battle of Lone Pine and also included a series of other attacks along the Anzac perimeter at the Nek, Pope's Hill and Quinn's Post. Queenslanders played important roles in the August Offensive, with the 2nd Light Horse Regiment leading the offensive at Quinn’s Post, and Queensland’s Major Thomas Glasgow commanding two regiments from the 1st Light Horse Brigade. 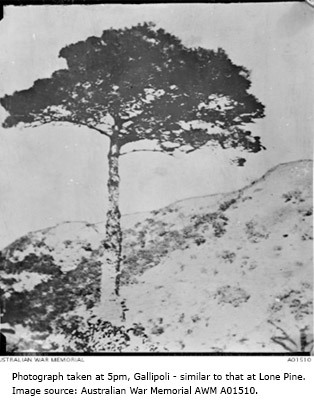 The ridges, once covered with the Aleppo pine, had been cleared by Turkish troops and placed over the top of their trenches to provide cover, leaving just one, solitary pine standing. The area became known as Lone Pine ridge. Seven Victoria Crosses were awarded to Australian troops for their valour and bravery during the August Offensive, the most in any single Australian action. Read more about the Gallipoli Victoria Cross recipients. Seeds brought back from Lone Pine ridge produced trees, one of which now honours fallen soldiers at the Australian War Memorial. Seeds from that tree have been propagated to a new generation of trees that are now used across Australia for commemorative purposes. Read more about the Lone Pine trees. find out about seedlings available for commemorative purposes.